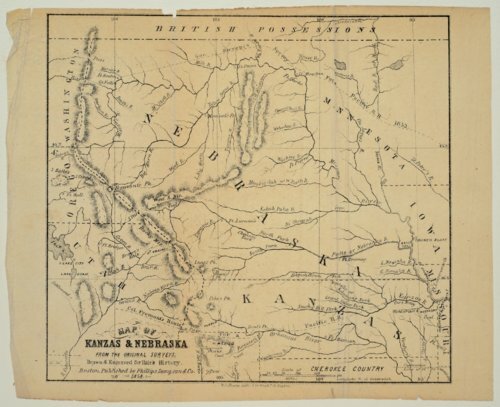 Map of Kanzas Territory and Nebraska Territory drawn and engraved for Salma Hale's History of the United States of America. Landmarks include the Spanish Peaks, Pike's Peak, Col. Fremont's expedition route, Bent's Fort, Chimey Rock, and the Pacific Railroad. This map is provided through a co-operative project between the Lecompton Historical Society and the Kansas Historical Society. Partial funding was provided by the Ross and Margaret Wulfkuhle Charitable Trust and the Freedom's Frontier National Heritage Area. Creator: Phillips, Sampson & Co.